It has been all sorts of cray-cray around here lately. Earlier this month, we were in Jersey visiting my boyfriend's family. I'd no sooner returned when my mom came to Atlanta to visit for a week. Now that she's gone, we're heading down to Destin, FL, tomorrow - a last hurrah before my boyfriend's brother heads off to Germany for a three-year military stint. And then as soon as we get back, my pops will be in town for a business conference. Yowza! All the traveling and entertaining means it's been a wee bit hard to maintain a healthy diet. There have definitely been some splurges the past few weeks (hello Morelli's salted caramel ice cream!) but all in all, I think I did okay. I recently started running again, loaded up on fresh fruits and veggies at the farmers market and grilled out a couple of the nights we had folks in town, making some fantastic but low-cal variations on all my favorite BBQ foods. out a couple of those nights, which means you can find healthy alternatives to some of those fatty (and dee-lish) BBQ foods. Case in point...see below. And thanks to Splenda.com for the following recipes. * If your host is offering hot dogs, burgers and chicken breast, go for the chicken (but remove the skin if it's still on there). The chicken is your safest bet for a low-cal, low-fat meat fix. * Are turkey burgers, turkey franks or chicken sausage up for grabs? Be careful! Some are lean, but others have almost as much fat and calories as the beef versions. * Is it a BYOM (Bring Your Own Meat) event? Show up with skinless boneless chicken breast, fat-free hot dogs (or ones with less than 5% fat) and Boca Meatless Burgers. 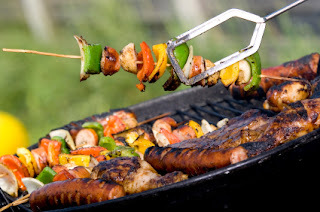 They all grill up AMAZINGLY well on the BBQ, taste fantastic and will save you tons of fat and calories! * If you're drinking beer, make it light. You'll save calories and carbs! Psssst... Beck's Premier Light has just 64 calories and 1 Point per 12 oz. bottle! * When it comes to frozen treats, stick with non-creamy ones. Fruit bars and shaved ice are better choices than ice cream treats like cones, bars and sandwiches. * BBQ some veggies! Corn on the cob, asparagus and onions are awesome when grilled, and they'll fill you up. But skip the butter. That's all, folks. Happy Memorial Day and see you next week. P.S. Keep your fingers crossed I don't break any limbs while hiking and paddling around waterfalls.